The Eastin Grand Hotel Sathorn was the second hotel I stayed during my 9D8N trip. Centrally located in the Sathorn Business District, AirAsia hosted bloggers from all around the world in this 5-star hotel for the #AABC AirAsia Blogger Community 2015 event. With all the activities, I didn’t have much time to explore this hotel, so I will just share with you what I experienced! Eastin Grand Hotel Sathorn Bangkok offers 390 guest-rooms and suites, namely Superior, Superior Sky, Executive Superior Sky, Executive Deluxe, Premium Deluxe and Junior Suite. In a glance, you can see that the Superior room (32 sqm) is decorated in a modern residential style with subtle tones and each room has individually controlled air conditioning, LCD TV with international satellite channels, free Wi-Fi internet (Woohoo! – It’s got strong network!) IDD telephone, tea & coffee-making facilities, hairdryer and in-room safe. Besides the ultra comfortable king-size bed and the fully stocked mini bar, the hotel room has sockets which allows Singapore’s Type G Plug. This means no converter is needed here! Iron and ironing board is also available upon request. For Eastin Grand Hotel, only Executive Deluxe, Premium Deluxe and Junior Suite has both shower and bathtub. The Superior Room’s bathroom only has shower (cries). Like most hotels, the toiletries include only shower caps, vanity kit, emery board, body lotion and soap bar (no toothbrush). It seems pretty common that hotels in Bangkok doesn’t provide that, so remember to bring your own toothbrush and toothpaste! Depending on where your room is, from Eastin Grand Hotel Sathorn, you can either get to see the majestic Chao Praya River or the city-scape. My room (Room 2004) allow me to enjoy the panoramic view of Bangkok’s city skyline at 4199 Baht (≈SGD$164) While I don’t really appreciate the day-view, I love the evening sunset view of the landscape. This is taken with just my iPhone 5S, imagine how beautiful it would be if it’s taken with an even better camera! (2) POSTPAID Payment (Payable at the end of your stay). A valid credit card is required for payment guarantee. (3) One child of 16 years or under sharing their parents’ room will receive a complimentary extra bed and breakfast. Other extra person will be charged at 1,500++ Baht/pax. The Glass House Restaurant at level 5 was the place we had our breakfast buffet. Operating from 6am to 11.30pm, The Glass House is an all day dining restaurant which has sumptuous daily buffets and multi-ethnic à la carte items. Here’s Seth Lui and Tony enjoying their breakfast while I stole a secret wefie. But yes, Tony caught me :P. I read on the hotel’s website describing the restaurant, saying “The Glass House at Eastin Grand Hotel Sathorn Bangkok is quite simply the best. The best value, the best variety and the best fare available in Bangkok today.” Now, let’s see how true it is: Best Variety:✓ Indeed, I was pretty impressed with the variety The Glass House has. With just the fruits, cereals and yogurts alone, they have more than 5 options for each. What caught my attention was how “international” the buffet was. When most hotels state “international buffet”, it usually mean western meals with cereals, bread and butter. Here, they have Chinese dim sum, Japanese sushi and even salad bar with homemade dressing. I was spoilt for choice, thanks to the Executive Chef Stefan Nietscher. Best Fare:✓ When in Thailand, eat as the Thai eats. This was my favourite corner out of all the other food. Here, you get to choose what you want in your bowl of Noodle Soup cooked on the spot. I hate to exaggerate, but when I return for a second serving (Tony had three! ), it is really delicious. Best Value:✓ While I did not display all the food available at The Glass House (which I believe is subjected to change from day-to-day), here’s my top 3 recommendations: The red dates bun, the machine-made mini pancakes drenched (by me) with chocolate sauce, honey and maple syrup and the authentic Thai noodle soup (add the seasonings if you like it spicy like me!). My choices were rather simple, but they are comfort food you wish go back for more! This is the part which I did not get to cover everything as I did not have time to request for an inspection. The facilities and amenities were located in various floors. Personally, I felt that the accessibility Eastin Grand Hotel Sathorn provides really made it one of the best hotel in Bangkok. However, the lift were rather slow, and the speed was more pronounced when I was on the #AABC Photo Rally! Everyone was trying to get into the lift and it was quite frustrating! That aside, let’s go down this “lift-list” with me to check out what they have! Starting for the top-most level, the hotel has 4 meeting rooms on the 33rd floor, offering spectacular views of the city skyline. That was also where we had our AirAsia Blogger Community 2015 Party! Moving down is the Executive Lounge at 32nd floor, where guests staying in the Executive Rooms get to enjoy complimentary all-day tea, coffee, soft drinks and snacks from 6am – 10pm. The evening open bar exclusively for Executive Level guests offers wines, beers, spirits, cocktails and hors d’oeuvres from 5.30pm to 7.30pm. At Level 15, the hotel has dedicated a family floor for travellers with young children. The floor consists of Superior and Executive Deluxe rooms with connecting rooms. The Kids Club at Level 15 provides toys, games and activities focusing on younger children. One floor down on the 14th floor, there are the Fitness Gym, Swimming Pool and the Luce Bar, for guests’ usage. The well equipped fitness centre operates from 6am – 10pm. Gym equipment has fully-integrated TV screens and music hubs on all cardio machines. Rooftop swimming pool is a highlight in many Bangkok hotels. Here, the infinity swimming pool provides guests with stunning views of Bangkok and the famous Chao Phraya river. Besides that, you can also enjoy light snacks, drinks and relax in the little comfortable seats by the pool. Adjacent to the swimming pool, the Luce Bar serves Italian cuisine and fine wines from Frescobaldi, a popular spot for guests who wish to entertain their clients or friends in the evening. For reservations, please call Luce +66(0)2 210 8100 or email to luce@eastingrandsathorn.com There are some Meeting Rooms at level 12 too for conferences and events. That was also the place we had our briefing for the AirAsia Blogger Community Photo Rally Hunt. See how many people one meeting room can hold! On the 11th floor, there is the Surasak Ballroom which is spread over two entire floors. It is able to accommodate up to 600 guests or be sub-divided into three smaller rooms. On the 3rd floor, there’s Chef Man – a Chinese-Cantonese cuisine restaurant opened by Master Chef Wai Yin Man which (I heard) was pretty hard to book. Service time: Lunch 11am – 2.30pm | Dinner 6pm – 10pm. Located at lobby floor, Swizzles is a place where you can relax and unwind between 10am – 12 midnight. At this lobby bar, you can get a full range of international wines and spirits, beers, refreshing cocktails, freshly squeezed juices, the finest coffees and teas and a selection of homemade tapas and tempting snacks for you to enjoy with mellow jazz and lounge sounds. 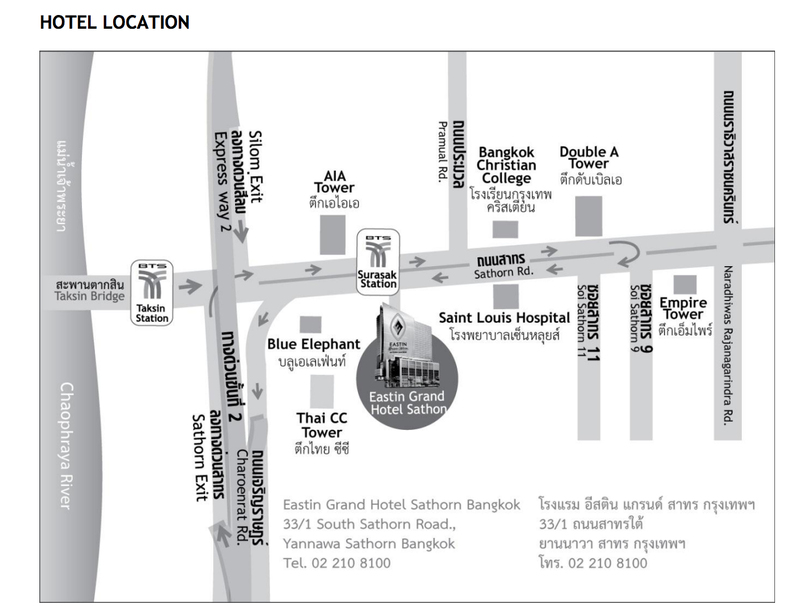 Where’s Eastin Grand Hotel Sathorn? For more information: Visit Eastin Grand Hotel Sathorn Website | Facebook Page OR book your room via Agoda now! Eastin Grand Hotel Sathorn is the only hotel in Bangkok with its own direct access to the BTS Sky Train system at Surasak Station. This is literally bringing the city to your doorstep. The hotel is also just minutes from the world famous Chao Praya River and a short drive via the nearby expressway to Suvarnabhumi International Airport. From the airport, it is only a 45 minute drive away. From Suvarnabhumi Airport – Enter the expressway in Dao Kanong direction. Take Sathorn exit, go straight on and turn right on to Sathorn Road and keep right, make a u-turn before traffic lights and keep left. The hotel is located on the left hand side of the road. From Don Muang Airport – Enter the toll way then expressway in Dao Kanoang – Rama9 direction. Take Dao Kanong direction use Silom exit, go straight on and turn left on to Sathorn Road and keep right, make a u-turn before traffic lights and keep left. The hotel is located on the left hand side of the road. The hotel also provide chauffeur-driven transportation, with knowledgeable English-speaking drivers to and from the two airports. 1- 3 pax: 1,850 Baht(1 way) | 3,600 Baht (round trip) via car. 4-8 pax: 2,400 Baht (1 way) | 4,600 Baht (round trip) via commuter van. – For convenience, show the you either show the above address in Thai language to the Taxi Driver, OR save or print Eastin Grand Hotel Sathorn. – If not, you can ask the taxi driver to contact the concierge (+66(0)2 210 8100) for direction. Another hotel review! How many did you all stay in total?? I never use hotel toiletries, so it doesn’t matter. But if hotels do provide, it will be a good back-up. The place is so spacious and classy type with nice furnitures – bedding. It’s very great to stay with loved ones all through-out. You have a nice room. Good thing other hotel amenities are there. Whenever I am looking for a hotel to stay in, I always take the location into consideration. Near shopping malls is a good one. The superior room is even larger than our bedroom. It’s filled with really cool devices and the free wi-fi internet is a win. The Cantonese-Chinese restaurant also sounds promising because it’s a pleasure to taste food prepared by a master chef. I love the infinity pool at Eastin Grand Hotel Sathorn in Bangkok. The buffet breakfast was alright, the noodles is my preference. I had that for 2 days in a row. Great to meet you at that trip. A memorable one. did you go hotel-hopping in bkk recent? or did i mixed up the blogs i’ve read huh… haha! anyway this hotel looks good! having no hotel toothbrush doesn’t bother me. i’ll never use them anyway, they’re often so hard they make my gums bleed. Haha… Yes. 4 hotels in 9Days… Almost like a Hotel Hopping! Ya, many hotel’s toothbrush are quite hard! You have a really nice view from your room. It’s nice also that they have a lot of facilities for guests. This looks perfect for a family vacation or just to have stay cation. Love their breakfast spread so yummy it is ! Ok! I will~ Want to go back soon if not for the bombings! woah! lovely view from your hotel room. id love to have a staycation in that place. Wow, how many hotels did you get to stay in Bangkok? Me, I am not really picky with hotels since we are usually out going around. Just air conditioning, hot water, cable tv and free wifi is enough. Haha… I stayed in 4 hotels. Imagine the moving! Mine’s the bathtub! This hotel – and the Superior Room – looks amazing! The view is beautiful – and it looks like the restaurant is wonderful too! I love that the room looks clean! Among the amenities, I think I’ll like the swimming pool best. I always like it when the hotel comes with a pool. However I’m not very picky with hotels either because I barely really stay inside. Unless with my husband who enjoys comfort, that’s the only time I’d splurge, hah.